Click here for the bride, groom, and bridal party! The Queen sets the tone, as always, in lemon and lime and purple from Stewart Parvin with a matching Angela Kelly hat. It’s no Neon Birthday Queen, but it still can’t be missed. 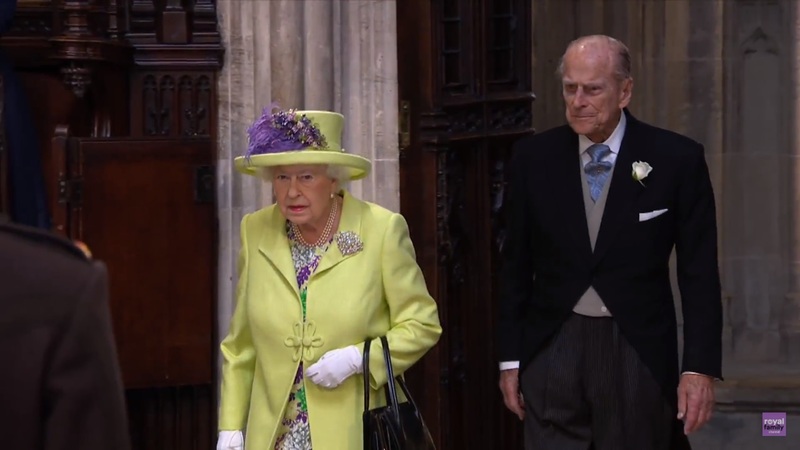 She also sized up the bling with the Richmond Brooch. It occurs to me that these two outfits are really a lot alike in certain ways. Both could be repeats; Camilla’s is a new outfit from Anna Valentine that sticks to her usual pastels and her usual shapes, and Kate’s McQueen coat is so much the same as what she wore for Princess Charlotte’s christening that I’m not actually sure if it is a repeat or not. I’m certain plenty of you are ready to line up in the comments and tell me that’s on purpose, to make sure she doesn’t upstage the bride. 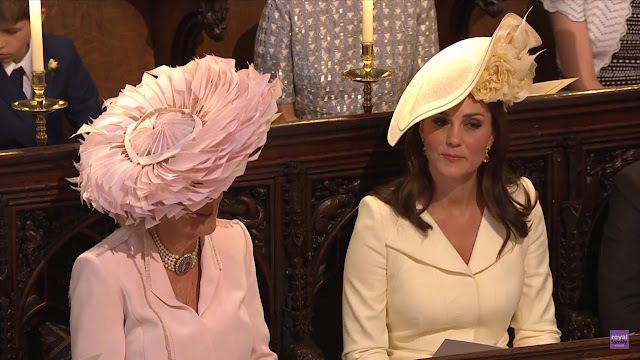 They both sported sculptural hats from Philip Treacy – just look at the structure involved on Camilla’s! That’s a feat of architecture. You can’t even see her face in lots of the photos, which is par for the course. 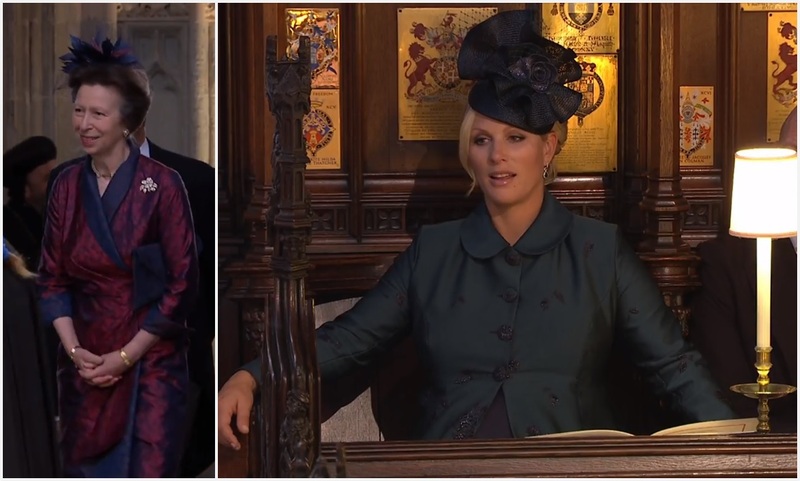 And they both went big on the jewel front, Camilla with her Pink Topaz Choker (my faaaaave) and Kate with another new earrings from Kiki McDonough, plus a ring. An unlikely twin act, you see. We laughed so hard at Princess Beatrice’s last big royal wedding hat, she very nearly didn’t give us one this time around. This Stephen Jones hat is not much more than a headband. Of course, it was the right choice for her custom Roksanda dress, which has enough going on by itself. Princess Eugenie toned it down in retro fashion in a blue Gainsbourg dress that doesn’t really get interesting until you see the back. Her Fiona Graham pillbox hat was the perfect complement. 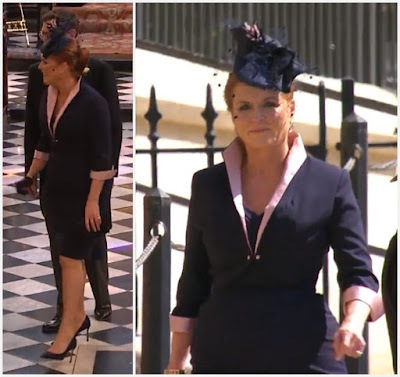 Sarah, Duchess of York followed suit in an understated outfit by Emma Louise Design and Jess Collett hat. Reads a little dated to me, but a nice effort overall. All Sophie’s faves came to the party: outfit from Suzannah, long length, bespoke Jane Taylor hat. I think this outfit needs the longer length to make it special enough for the occasion, and simultaneously I’d like her to shorten the skirt. I’m difficult like that. 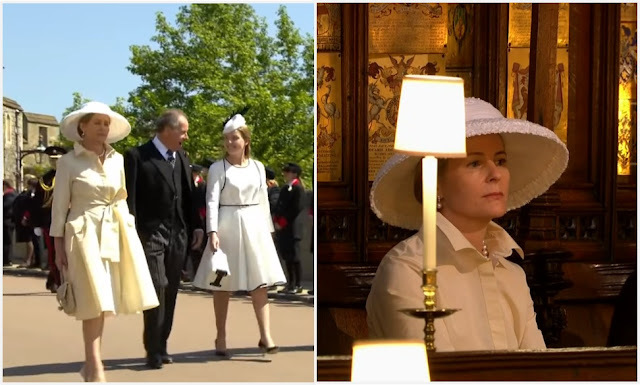 Lady Louise looked great while dressing out of her mother’s closet (as pointed out by the Countess of Wessex Blog) in an Alaïa outfit. 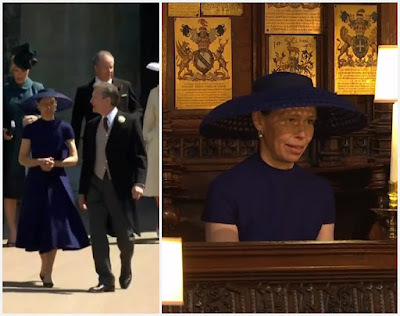 Of all the blue ladies – and these are the Windsors, so there’s a lot – Autumn and Sarah Chatto really hit it out of the park for me. Autumn’s dress, by Ceri Brooks of Hen House worn with a Juliette Botterill hat, flowed so well on the walk to the church and teal is one of my weaknesses. Sarah’s Jasper Conran dress is more colorful than her usual palette, topped with a bigger Stephen Jones hat than she usually goes for, and it all works. She gets me every time, she does. Also joining the blue-ish crew (accents of blue...whatever, just go with it), we have the Princess Royal and Zara Tindall in a Claire Mischevani teal coat with embossed navy detailing, a navy silk dress, and a Rosie Olivia hat. Is it bad that my first thought was that Anne had a hat made to go with Hugh Hefner’s best robe? Zara looked so exquisitely uncomfortable, I’ll just note that her hair was fantastic and leave it at that. Is this classic or what? Shirt dress with a full skirt, strand of big pearls, wide brim hat. Serena, she always gets me too. (Her Rachel Trevor-Morgan hat is a repeat from another big royal event, the Thanksgiving Service for the Diamond Jubilee.) Lady Margarita Armstrong-Jones, in the white with black trim, followed suit with Lady Louise and borrowed something from mom's wardrobe. Serena wore this outfit to Ascot in 2017. 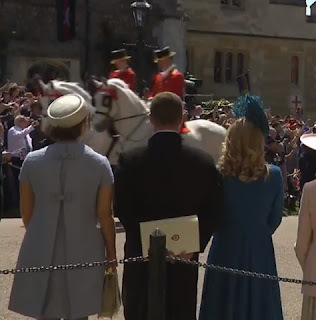 No disrespect to the rest of the royal ladies in attendance, but we only have the briefest of glimpses. 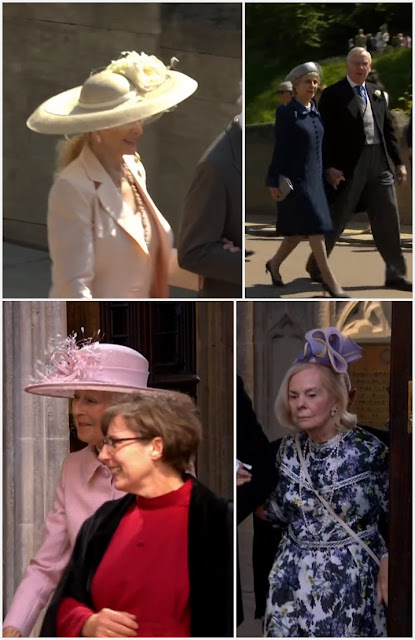 Looks like business as usual for Princess Michael of Kent and the Duchess of Gloucester, with some lovely pink from Princess Alexandra and a bit of pattern to pep it up from the Duchess of Kent. 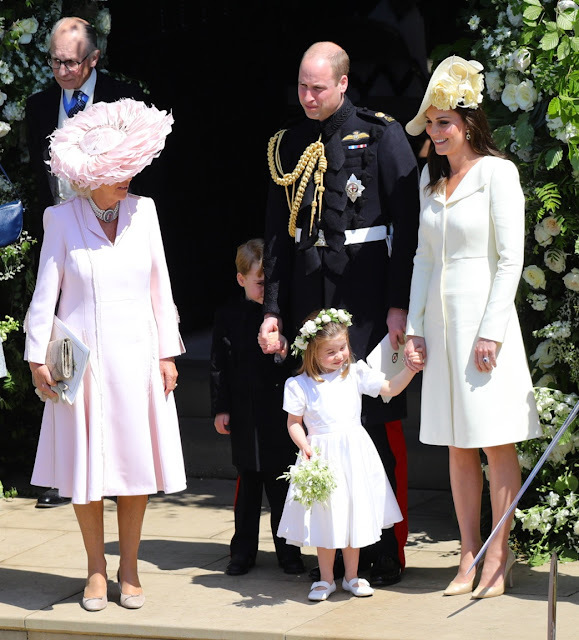 Who was your best dressed Windsor guest?